Twenty accessible rocky intertidal sites were selected to span the ‘kill-zone’ and peripheral locations (see list of sites in Jurgens et al. submitted). Two rocky intertidal areas were sampled per site, usually one on either side of the point of entry onto the beach and separated by approximately 100 m. We used quadrats (1m2 [4 * 0.25 m^2] or 0.0625 m^2) and swaths (2 m wide transects) to estimate juvenile and adult abundance for each target species. This data set includes counts of Pisaster ochraceus, Cryptochiton stelleri and Leptasterias sp. in quadrats and swaths along the California coast from 37.9 N to 38.9 N.
We exhaustively searched 32-40 one-meter square quadrats per site (i.e. 16-20 per each of 2 areas), recording GPS waypoint, time, percent cover of major habitat types, and abundances and sizes of target species for each quadrat. Quadrat locations were selected by first finding one of the target habitat types - surf grass, low-zone red algae, coralline turf, cobble or boulder field, urchin pools with pits either empty or occupied, or mussel bed - selecting a starting point haphazardly, and then using a random numbers table to choose specific quadrat locations. Some sites had fewer than 32 quadrats or quadrats smaller than one-square meter due to the limited time in which we could work in suitable habitat. For mussel habitat one 0.25 m x 0.25 m quadrat was used. For Jurgens et al. (submitted) we calculated the number of each target species summed across all quadrats surveyed within each of the two areas within sites. Timed, GPS-tracked, 2 m wide swath transects were nested within each of the two areas within all sites. From a distance, an approximate starting point and orientation (with landmarks) for the starting transect was selected. The GPS was set to auto-record a trackpoint every 6 seconds. Transects ran from the most shoreward to the most seaward possible suitable habitat at approximately 10 m intervals along shore, particularly targeting the low zone when the tide was the lowest, with as many transects being done as permitted by the tide. The start and end of each transect was GPS waypointed and recorded. All target species were searched for across the 2 m wide swath, with intertidal zones and habitat type recorded. A waypoint was recorded for each individual target species, with any additional species found within a meter being counted and recorded for the same waypoint. When the field of view was clear some swaths were extended to 4 meters wide. For Jurgens et al. (submitted) we calculated the number of each target species summed across all swaths within each of the two areas within sites. To estimate swath length we first summed the Euclidean distances between consecutive GPS trackpoints. 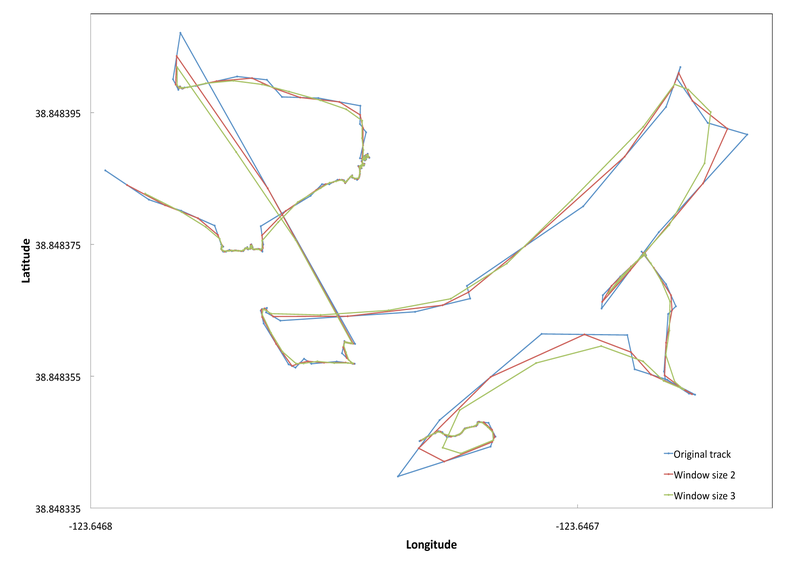 Given the GPS had an error of +/- 3 meters we smoothed the GPS tracks by averaging across two trackpoints and then by three. We selected a window size of two with which to estimate our total transect length to adjust for the noise in our swath transects but to minimize oversmoothing. (see example figure below). We identified and removed outlying trackpoints that led to a Euclidean distance >=8 meters (likely due to temporarily poor satellite signal). The distance was then recalculated between the trackpoints immediately preceding and following the removed trackpoint. Total transect search area was calculated by multiplying the total adjusted transect length by swath width. Total transect search time was estimated using field notes and GPS waypoints and trackpoints, removing 6-second intervals where < 0.05 m were traveled (suggesting this was time during which notes were being written or tissues samples were being collected). Swath figure: Sample GPS tracks for two transects at Iversen Point, Mendocino County. The blue line is the original unsmoothed track. The red line represents a window size of two, averaging latitudes and longitudes across each pair of consecutive trackpoints. The green line represents a window size of 3, averaging across 3 trackpoints. The Global Positioning System (GPS) is a U.S. space-based radionavigation system that provides reliable positioning, navigation, and timing services to civilian users on a continuous worldwide basis. The U.S. Air Force develops, maintains, and operates the space and control segments of the NAVSTAR GPS transmitter system. Ships use a variety of receivers (e.g. Trimble and Ashtech) to interpret the GPS signal and determine accurate latitude and longitude.